SUPERNATURAL: Yikes, Nick. I really hope we don’t get a full return to Lucifer—because it’s been done, and some things need to be final—but clearly things are going down a dark path. And ohhhh boy, what’s going on with Dean? MOM: I’m really glad the show addressed that Bonnie relapsed while taking pain medications back in season 2; it was beautifully understated to have her help Tammy along with her own injury while addressing how far she’s come herself. I’m also happy Christy got a legit win with a paid job heading her way. Look, there are worse ways Grace could have met Noah’s daughter. And it could have gone a lot worse, too. But it also makes sense he’d want to be careful about his kid. But they’ve taken a lot of big steps—and it’s hard to believe a romance with a big-name guest star will go the distance—and it’s cute how happy Grace and Noah are together. MURPHY BROWN: It was a good, but depressing episode. It feels like in many ways it was too close to home, because I have friends who work for outlets that don’t just cover entertainment. And as hard as the episode went at the attacks against journalists, it’s a sad testament to the state of the world that they absolutely could have gone harder with the attacks, especially given that Murphy is both a woman and not 20-something. 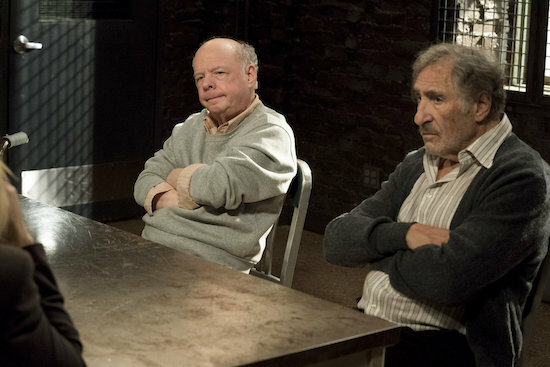 LAW & ORDER: SPECIAL VICTIMS UNIT: Judd Hirsch and Wallace Shawn were great. The misdirect at the start felt clunky—and I know there was concern about it being offensive—and I’m not sure what it really added to the episode, outside of an apparently super easy murder investigation. But Hirsch and Shawn were heartbreaking in their quiet, private agony.